Need a little push to curl up with a good book this summer? 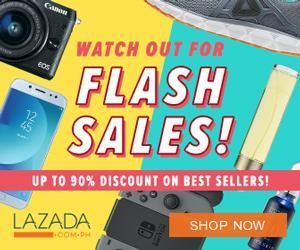 Then, don’t miss the National Book Store Great Warehouse Sale 2019! There is something about the lazy days of summer that invites a special kind of literary drifting. After all, summertime also means it’s time to get away — even if it’s simply traveling through the pages of a good book! 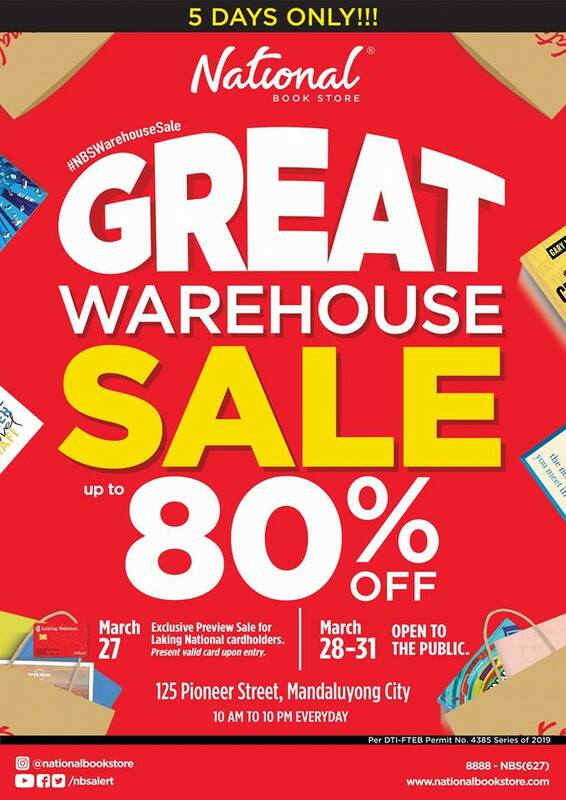 So if you are planning to replenish your shelves or simply in search of boredom busters this hot season, better check out National Book Store Great Warehouse Sale 2019. Shop for great books, supplies, toys and games, and up to 80% OFF from March 27 to 31, 2019. 1. Is there an admission fee? No, admission is completely free. 2. Do I need to have a valid Laking National Card to shop on March 27? Yes, the first day of the sale is exclusively for Laking National Cardholders. 3. If I have a Laking National card, can I bring a companion with me on March 27? No, it’s strictly one person per card on March 27, except for children aged 6 years old or below. 4. I don’t have a Laking National Card yet. Can I apply for one before the sale? Yes, you may apply for a card at any of our branches before March 27. The branch closest to the venue is at the Quad Alpha Centrum Building. 5. How can I commute to the venue? Via Grab or Angkas: Search for ‘Quad Alpha Centrum Building’ and select it as your drop-off point. 6. I’m driving to the venue. Where can I park? Limited parking slots are available at the venue. Other areas where you may park include the nearby HMR and McDonald’s, Robinsons Forum, SM Light, and Pioneer Center. You may also search for more parking areas using Waze or Google Maps. 7. Does the venue have air-conditioning? No, the venue does not have air-conditioning. However, there will be several large fans. 8. Will there be comfort rooms? Yes. 9. Where can I buy food and drinks? There will be a vending machine at the venue. There are also several different stores you can buy food and drinks from near the venue. 10. Is there a limit to the number of attendees? To ensure the safety and comfort of all shoppers, we reserve the right to limit the number of customers inside the venue when necessary. 11. Will I earn points on my Laking National Card? No, discounted items are not eligible for earning of points. 12. Is there a way to look for specific books / items in the sale? Yes, just approach the customer service area or any of our personnel in the venue. However, we cannot guarantee real-time availability and stocks of items. 13. An item I purchased is damaged / defective. Can I get it replaced? Or can I get a refund? Unfortunately, all items included in this sale have been fully marked down due to various reasons, including any damage that may not be physically apparent. They are being sold on an AS IS basis and are therefore considered as final sale. We encourage you to carefully inspect your items before paying for them at the counter.